Calvin Klein, Inc. announced that CALVIN KLEIN 205W39NYC wardrobed actors Carey Mulligan and Jake Gyllenhaal as well as Zoe Kazan for a special screening and reception of IFC Films Wildlife sponsored by CALVIN KLEIN ETERNITY at Il Gattopardo in New York City earlier today. Ms. Mulligan, who stars in Wildlife, wore a Fall 2018 CALVIN KLEIN 205W39NYC black 205W39NYC logo turtleneck and a blush leather pencil skirt with zipper. 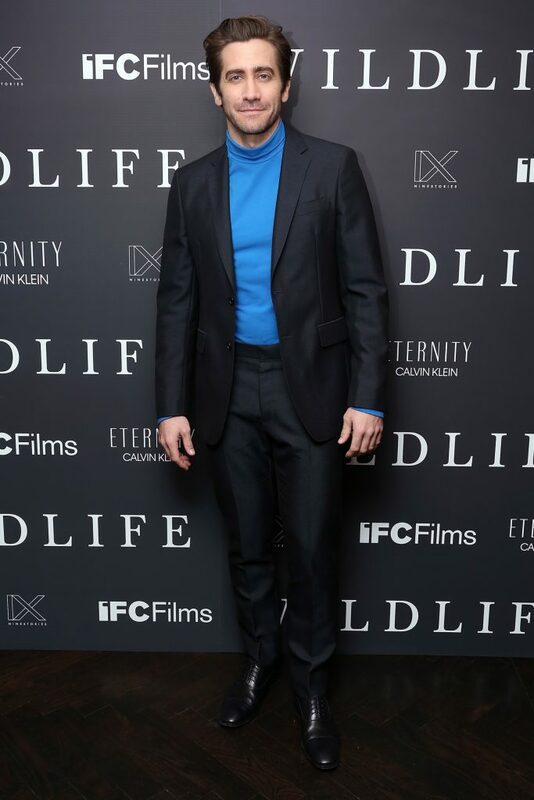 Mr. Gyllenhaal, who stars in Wildlife, wore a CALVIN KLEIN 205W39NYC dark navy wool mohair single-breasted suit with a bright blue 205W39NYC turtleneck. Ms. Kazan, who co-wrote Wildlife, wore a Pre-Spring 2019 CALVIN KLEIN 205W39NYC blue silk dress with bow detail and black patent leather Kadence pumps.